Ibuprofen (INN) (/ˈaɪbjuːproʊfɛn/ or /aɪbjuːˈproʊfən/ EYE-bew-PROH-fən; from iso-butyl-propanoic-phenolic acid) is a nonsteroidal anti-inflammatory drug (NSAID) used for pain relief, fever reduction, and for reducing swelling. Ibuprofen has an antiplatelet effect, though relatively mild and somewhat short-lived compared with aspirin or prescription antiplatelet drugs. In general, ibuprofen also has a vasodilation effect. Ibuprofen is a 'core' medicine in the World Health Organization's Model List of Essential Medicines necessary to meet the minimum medical needs of a basic healthcare system. Ibuprofen was derived from propanoic acid by the research arm of Boots Group during the 1960s and patented in 1961. Originally marketed as Brufen, ibuprofen is available under a variety of popular trademarks, including Motrin, Nurofen, Advil, Nuprin and many others. Generic formulations are available as well. Ibuprofen is used primarily for fever, pain, dysmenorrhea and inflammatory diseases such as osteoarthritis and rheumatoid arthritis. It is also used for pericarditis and patent ductus arteriosus. Ibuprofen has a dose-dependent duration of action of around four to eight hours, which is longer than suggested by its short half-life. Onset of analgesia (time to effect) is 24.5 minutes using liquigel format orally. The recommended dose varies with body mass and indication. A dose of 400 mg per dose and 1200 mg per day is considered the maximum amount for over-the-counter use. Unlike aspirin, which breaks down in solution, ibuprofen is stable, thus it can be available in topical gel form, which is absorbed through the skin, and can be used for sports injuries, with less risk of digestive problems. In Europe, Australia, and New Zealand, ibuprofen lysine (the lysine salt of ibuprofen, sometimes called "ibuprofen lysinate" even though the lysine is in cationic form) is licensed for treatment of the same conditions as ibuprofen. The lysine salt increases water solubility, allowing intravenous use, and is indicated for closure of a patent ductus arteriosus in premature infants weighing between 500 and 1,500 grams (1 and 3 lb), who are no more than 32 weeks gestational age when usual medical management (e.g., fluid restriction, diuretics, respiratory support, etc.) is ineffective. With regard to this indication, ibuprofen lysine is an effective alternative to intravenous indomethacin, and may be advantageous in terms of kidney function. Ibuprofen lysine has been shown to have a more rapid onset of action compared to acid ibuprofen. In UK Ibuprofen Lysine is marketed as express pain relief, tension headache relief and more commonly migraine relief medicine. Usually available in packing of 16 342 mg tablets the pack is marketed OTC by most superstores and pharmacies as their own branded product including, but not limited to, Asda, Tesco and Superdrug. Common adverse effects include: nausea, dyspepsia, gastrointestinal ulceration/bleeding, raised liver enzymes, diarrhea, constipation, epistaxis, headache, dizziness, rash, salt and fluid retention, and hypertension. A study from 2010 has shown regular use of NSAIDs was associated with an increase in hearing loss. Infrequent adverse effects include: esophageal ulceration, heart failure, hyperkalemia, renal impairment, confusion, and bronchospasm. Ibuprofen can exacerbate asthma, sometimes fatally. Ibuprofen appears to have the lowest incidence of digestive adverse drug reactions of all the nonselective NSAIDs. However, this holds true only at lower doses of ibuprofen, so over-the-counter (OTC) preparations of ibuprofen are, in general, labeled to advise a maximum daily dose of 1,200 mg.
Ibuprofen may be quantitated in blood, plasma, or serum to demonstrate the presence of the drug in a person having experienced an anaphylactic reaction, confirm a diagnosis of poisoning in hospitalized patients, or assist in a medicolegal death investigation. A nomogram relating ibuprofen plasma concentration, time since ingestion, and risk of developing renal toxicity in overdose patients has been published. Along with several other NSAIDs, chronic ibuprofen use has been found correlated with risk of hypertension and myocardial infarction (heart attack), particularly among those chronically using high doses. In older hypertensive patients treated with hydrochlorothiazide, ibuprofen in doses of 1800 mg per day was found to significantly increase systolic blood pressure. A 2011 study in the Archives of Internal Medicine reported a 51% increase in the rate of renal cell carcinoma, the most common form of kidney cancer, in nurses who regularly took ibuprofen and other NSAIDs, such as naproxen. Along with other NSAIDs, ibuprofen has been associated with the onset of bullous pemphigoid or pemphigoid-like blistering. As with other NSAIDs, ibuprofen has been reported to be a photosensitising agent, but it is considered a weak photosensitising agent compared to other members of the 2-arylpropionic acid class. Like other NSAIDs, ibuprofen is an extremely rare cause of the autoimmune disease Stevens-Johnson syndrome (SJS). Drinking alcohol when taking ibuprofen may increase risk of stomach bleeding. According to the US Food and Drug Administration, "ibuprofen can interfere with the antiplatelet effect of low-dose aspirin (81 mg per day), potentially rendering aspirin less effective when used for cardioprotection and stroke prevention." Allowing sufficient time between doses of ibuprofen and immediate-release (IR)aspirin can avoid this problem. The recommended elapsed time between a 400-mg dose of ibuprofen and a dose of aspirin depends on which is taken first. It would be 30 minutes or more for ibuprofen taken after IR aspirin, and 8 hours or more for ibuprofen taken before IR aspirin. However, this timing cannot be recommended for enteric-coated aspirin. But, if ibuprofen is taken only occasionally without the recommended timing, the reduction of the cardioprotection and stroke prevention of a daily aspirin regimen is minimal. A 2005 study linked long-term (over three months) use of NSAIDs, including ibuprofen, with a 140% higher risk of erectile dysfunction. The study, conducted at Kaiser Permanente and published in the Journal of Urology, reported, "regular nonsteroidal anti-inflammatory drug use is associated with erectile dysfunction beyond what would be expected due to age and other conditions". The director of research for Kaiser Permanente added, "There are many proven benefits of nonsteroidals in preventing heart disease and for other conditions. People shouldn't stop taking them based on this observational study. However, if a man is taking this class of drugs and has ED, it's worth a discussion with his doctor". Ibuprofen overdose has become common since it was licensed for OTC use. Many overdose experiences are reported in the medical literature, although the frequency of life-threatening complications from ibuprofen overdose is low. Human response in cases of overdose ranges from absence of symptoms to fatal outcome despite intensive-care treatment. Most symptoms are an excess of the pharmacological action of ibuprofen, and include abdominal pain, nausea, vomiting, drowsiness, dizziness, headache, tinnitus, and nystagmus. Rarely, more severe symptoms, such as gastrointestinal bleeding, seizures, metabolic acidosis, hyperkalaemia, hypotension, bradycardia, tachycardia, atrial fibrillation, coma, hepatic dysfunction, acute renal failure, cyanosis, respiratory depression, and cardiac arrest have been reported. The severity of symptoms varies with the ingested dose and the time elapsed; however, individual sensitivity also plays an important role. Generally, the symptoms observed with an overdose of ibuprofen are similar to the symptoms caused by overdoses of other NSAIDs. Correlation between severity of symptoms and measured ibuprofen plasma levels is weak. Toxic effects are unlikely at doses below 100 mg/kg, but can be severe above 400 mg/kg (around 150 tablets of 200 mg units for an average man); however, large doses do not indicate the clinical course is likely to be lethal. A precise lethal dose is difficult to determine, as it may vary with age, weight, and concomitant diseases of the individual patient. Therapy is largely symptomatic. In cases presenting early, gastric decontamination is recommended. This is achieved using activated charcoal; charcoal adsorbs the drug before it can enter the systemic circulation. Gastric lavage is now rarely used, but can be considered if the amount ingested is potentially life-threatening, and it can be performed within 60 minutes of ingestion. Emesis is not recommended. The majority of ibuprofen ingestions produce only mild effects and the management of overdose is straightforward. Standard measures to maintain normal urine output should be instituted and renal function monitored. Since ibuprofen has acidic properties and is also excreted in the urine, forced alkaline diuresis is theoretically beneficial. However, because ibuprofen is highly protein-bound in the blood, renal excretion of unchanged drug is minimal. Forced alkaline diuresis is, therefore, of limited benefit. Symptomatic therapy for hypotension, gastrointestinal bleeding, acidosis, and renal toxicity may be indicated. On occasion, close monitoring in an intensive-care unit for several days is necessary. A patient who survives the acute intoxication usually experiences no late sequelae. A Canadian study published in the Canadian Medical Association Journal of thousands of pregnant woman suggests those taking any type or amount of NSAIDs (including ibuprofen, diclofenac and naproxen) were 2.4 times more likely to miscarry than those not taking the drugs. Nonsteroidal anti-inflammatory drugs such as ibuprofen work by inhibiting the enzyme cyclooxygenase (COX), which converts arachidonic acid to prostaglandin H2 (PGH2). PGH2, in turn, is converted by other enzymes to several other prostaglandins (which are mediators of pain, inflammation, and fever) and to thromboxane A2 (which stimulates platelet aggregation, leading to the formation of blood clots). Like aspirin and indomethacin, ibuprofen is a nonselective COX inhibitor, in that it inhibits two isoforms of cyclooxygenase, COX-1 and COX-2. The analgesic, antipyretic, and anti-inflammatory activity of NSAIDs appears to operate mainly through inhibition of COX-2, whereas inhibition of COX-1 would be responsible for unwanted effects on the gastrointestinal tract. However, the role of the individual COX isoforms in the analgesic, anti-inflammatory, and gastric damage effects of NSAIDs is uncertain and different compounds cause different degrees of analgesia and gastric damage. To achieve the beneficial effects of ibuprofen and other NSAIDs without gastrointestinal ulceration and bleeding, selective COX-2 inhibitors were developed to inhibit the COX-2 isoform without inhibition of COX-1. Ibuprofen is only very slightly soluble in water. Less than 1 mg of ibuprofen dissolves in 1 ml water (< 1 mg/ml). Ibuprofen is produced industrially as a racemate. The compound, like other 2-arylpropionate derivatives (including ketoprofen, flurbiprofen, naproxen, etc. ), does contain a chiral center in the α-position of the propionate moiety. So two enantiomers of ibuprofen occur, with the potential for different biological effects and metabolism for each enantiomer. Indeed, the (S)-(+)-ibuprofen (dexibuprofen) was found to be the active form both in vitro and in vivo. It was logical, then, to consider the potential for improving the selectivity and potency of ibuprofen formulations by marketing ibuprofen as a single-enantiomer product (as occurs with naproxen, another NSAID). Further in vivo testing, however, revealed the existence of an isomerase (alpha-methylacyl-CoA racemase), which converted (R)-ibuprofen to the active (S)-enantiomer. An improved synthesis by BHC required only three steps. This improved synthesis won the Presidential Green Chemistry Challenge Greener Synthetic Pathways Award in 1997. Ibuprofen was derived from propionic acid by the research arm of Boots Group during the 1960s. It was discovered by Andrew RM Dunlop, with colleagues Stewart Adams, John Nicholson, Vonleigh Simmons, Jeff Wilson and Colin Burrows, and patented in 1961. The drug was launched as a treatment for rheumatoid arthritis in the United Kingdom in 1969, and in the United States in 1974. Adams initially tested his drug on a hangover. He was subsequently awarded an OBE in 1987. Boots was awarded the Queen's Award for Technical Achievement for the development of the drug in 1987. Ibuprofen was made available under prescription in the United Kingdom in 1969, and in the United States in 1974. In the years since, the good tolerability profile, along with extensive experience in the population, as well as in so-called phase IV trials (post-approval studies), has resulted in the availability of ibuprofen over the counter (OTC) in pharmacies worldwide, as well as in supermarkets and other general retailers. Ibuprofen is commonly available in the United States up to the FDA's 200 mg 1984 dose limit OTC, rarely used higher by prescription. In Canada, the OTC dose limit is 400 mg, with 600 mg and 800 mg routinely available by prescription. In 2009, the first injectable formulation of ibuprofen was approved in the United States, under the trade name Caldolor. Ibuprofen was the only parenteral for both pain and fever available in the country prior to the approval of Ofirmev (acetaminophen) injection by the FDA. 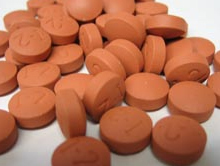 Ibuprofen is sometimes used for the treatment of acne, because of its anti-inflammatory properties, and has been sold in Japan in topical form for adult acne. As with other NSAIDs, ibuprofen may be useful in the treatment of severe orthostatic hypotension (low blood pressure when standing up). In some studies, ibuprofen showed superior results compared to a placebo in the prophylaxis of Alzheimer's disease, when given in low doses over a long time. Some of the aforementioned uses would be considered off-label uses in some countries. ^ Apstein CS,Vogel MM (January 22, 1982). Coronary arterial vasodilator effect of ibuprofen. PMID 7053413. ^ WHO Model List of Essential Medicines (16th ed.). World Health Organization (WHO). March 2009. Retrieved 2011-03-30. ^ WHO Model List of Essential Medicines for Children (2nd ed.). World Health Organization (WHO). March 2010. Retrieved 2011-03-30. ^ Stuart MC, Kouimtzi M, Hill SR, ed. (2009). WHO Model Formulary 2008 (2nd ed.). World Health Organization (WHO). ISBN 978-92-4-154765-9. Retrieved 2011-03-30. ^ WHO Model Formulary for Children 2010 (2nd ed.). World Health Organization (WHO). 2010. ISBN 978-92-4-159932-0. Retrieved 2011-03-30. ^ "PubMed Health - Ibuprofen". U.S. National Library of Medicine. 2010-10-01. Retrieved 2011-01-20. ^ a b "Ibuprofen". The American Society of Health-System Pharmacists. Retrieved 3 April 2011. ^ a b c "Ibuprofen". U.S. Food and Drug Administration (FDA). ^ "Topical NSAIDs: plasma and tissue concentrations". Bandolier. ^ "Neoprofen (ibuprofen lysine) injection. Package insert". Ovation Pharmaceuticals. ^ a b Rossi, S., ed. (2004). Australian Medicines Handbook (2004 ed.). Australian Medicines Handbook. ISBN 0-9578521-4-2. OCLC 224121065. ^ Ayres, JG, Fleming D, Whittington R. (1987). "Asthma death due to ibuprofen". Lancet. ^ Baselt, R. (2008). Disposition of Toxic Drugs and Chemicals in Man (8th ed.). Foster City, CA: Biomedical Publications. pp. 758–761. ^ Cortez, Michelle (September 12, 2011). "Commonly Used Pain Pills Increase Kidney Cancer Risk in Study". Bloomberg. ^ Chan, L. S. (2011). "Bullous Pemphigoid". eMedicine Reference. Medscape. ^ Raksha MP, Marfatia YS (2008). "Clinical study of cutaneous drug eruptions in 200 patients". Indian J Dermatol Venereol Leprol 74 (1): 80. doi:10.4103/0378-6323.38431. PMID 18193504. ^ "Information for Healthcare Professionals: Concomitant Use of Ibuprofen and Aspirin". U.S. Food and Drug Administration (FDA). 2006-09. Retrieved 2010-11-22. ^ a b "Non-steroidal anti-inflammatory drugs linked to increased risk of erectile dysfunction". sciencedaily.com. 2011-03-02. Retrieved 2011-06-07. ^ Mary Brophy Marcus (March, 2011). "New study links pain relievers to erectile dysfunction". USA Today. ^ "Miscarriage risk doubled: drug study". theage.com.au. 2011-09-07. Retrieved 2011-09-07. ^ "Pain Medications". eMedicine. 2006-02-13. Retrieved 2010-06-07. ^ a b "Ibuprofen — a case study in green chemistry" (pdf). Royal Society of Chemistry. ^ "Presidential Green Chemistry Challenge: 1997 Greener Synthetic Pathways Award". United States EPA. Retrieved 2009-08-18. ^ a b Lambert, Victoria (2007-10-08). "Dr. Stewart Adams: 'I tested ibuprofen on my hangover'". The Daily Telegraph (London). Retrieved 2008-01-20. ^ "Drug Approval Package: Caldolor (Ibuprofen) NDA #022348". U.S. Food and Drug Administration (FDA). March 11, 2010. ^ "FDA Approves Injectable Form of Ibuprofen" (Press release). U.S. Food and Drug Administration (FDA). June 11, 2009. ^ "FDA Approves Caldolor: Cumberland Pharmaceuticals Announces FDA Approval of Caldolor" (Press release). Drugs.com. June 11, 2009. Retrieved 2009-06-13. ^ "In Japan, an OTC ibuprofen ointment (Fukidia) for alleviating adult acne has been launched". Inpharma (Adis) 1 (1530): 18. March 25, 2006. ISSN 1173-8324. ^ Mary Brophy Marcus (March 2, 2011). "Ibuprofen may reduce risk of getting Parkinson's disease". USA Today. Human cells and cell membrane molecular models are affected in vitro by the nonsteroidal anti-inflammatory drug ibuprofen. Manrique-Moreno M, Villena F, Sotomayor CP, Edwards AM, Munoz MA, Garidel P, Suwalsky M.SourceFaculty of Chemical Sciences, University of Concepcion, Concepcion, Chile; Chemistry Institute, University of Antioquia, A.A. 1226, Medellin, Colombia. Biochimica et biophysica acta.Biochim Biophys Acta.2011 Nov;1808(11):2656-64. Epub 2011 Jul 21. Glycopolypeptide-encapsulated Mn-doped ZnS quantum dots for drug delivery: Fabrication, characterization, and in vitro assessment. Xu Z, Li B, Tang W, Chen T, Zhang H, Wang Q.SourceKey Laboratory of Nonferrous Metal Chemistry and Resources Utilization of Gansu Province, Lanzhou University, Lanzhou 730000, PR China. Colloids and surfaces. B, Biointerfaces.Colloids Surf B Biointerfaces.2011 Nov 1;88(1):51-7. Epub 2011 Jun 22. A comparative study of interaction of ibuprofen with biocompatible polymers. Khan IA, Anjum K, Ali MS, Din KU.SourceDepartment of Chemistry, Aligarh Muslim University, Aligarh 202002, India. Colloids and surfaces. B, Biointerfaces.Colloids Surf B Biointerfaces.2011 Nov 1;88(1):72-7. Epub 2011 Jun 21. 10 hours ago ... Explains the medication ibuprofen (Advil, Motrin, Nuprin, Medipren) a drug used for the management of mild to moderate pain, fever, and inflammation. Article includes descriptions, uses, drug interactions, and side effects.